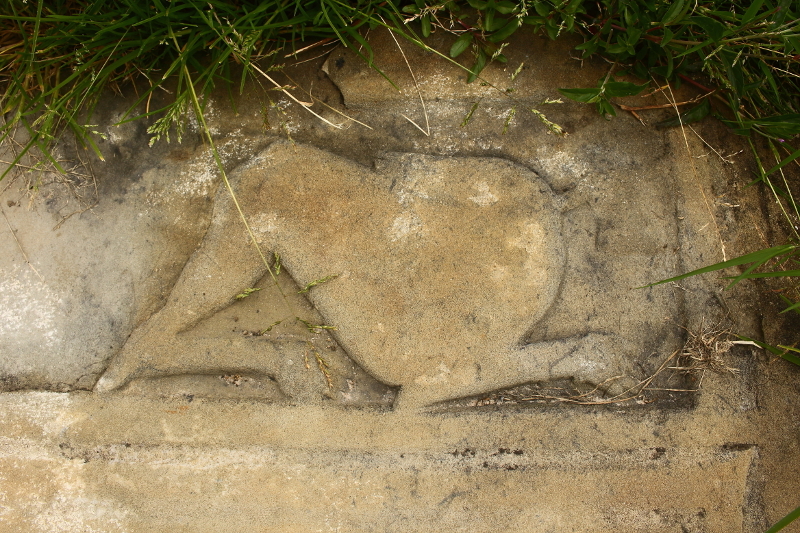 A depiction of the Dobhar Chu on a grave in Conwal Cemetry, Co. Leitrim. After a recent hillwalking outing in the Dartry Mountains, I took a diversion to Conwal Cemetry near Glenade in Co. Leitrim to see a particular grave which has a fascinating tale attached to it. The grave has a large stone, flat on the ground, with a raised depiction of the Irish mythical monster, the Dobhar Chu, which means “water hound” or “hound of the deep”. The Dochar Chu was said to be or dog or otter like creature, sometimes also referred to as half fish or the Irish crocodile, about 7 feet long, with a taste for human flesh. There are various historical accounts of sightings and fatal attacks by the monster, and the grave shown is said to be the resting place of an unfortunate woman who was actually killed by the creature in 1722! The gravestone is very weathered now, and I found the inscriptions impossible to read, but accounts online say that the woman, known as either Grace or Grainne, was washing clothes in Glenade Lough when she was seized and killed by the creature. Hearing her cries, her husband rushed to the scene only to find her body, with the Dochar Chu asleep on her corpse. He killed the beast, but its cries drew its mate which pursued him, until he battled and killed it too. The grave is said to show the Dochar Chu being speared. There is another account of these creatures in A Description of West or H-Lar Connaught by Roderick O’Flaherty in 1684 in which he tells the story of a man who had a narrow escape, almost being dragged into the waters of Lough Mask before driving the monster off with his knife. More recently, the artist Sean Corcoran claims with his wife to have seen one of the creatures on Omey Island in Co. Galway. It was certainly fascinating to see the grave, and maybe part of us wants to believe there are still creatures unknown to science out there, and mysterious monsters lurking in remote places, however unlikely in reality. Still, if you’re on the shore on an Irish lough, keep your eyes open! I have sent the image to fellow blogger Ed Mooney for his weekly Capturing History Challenge, specifically the Spooktacular Halloween edition. Ed’s blog at https://edmooneyphoto.wordpress.com is a brilliant site, mainly focused on Irish antiquities, ruins, history and myths/legends, all accompanied by fantastic black and white photography. For me, its one of the best blogs on wordpress and well worth subscribing to. Posted in PhotographyTagged Conwal Cemetry, Dochar Chu, Glenade, hound of the deep, Ireland, Leitrim, water houndBookmark the permalink. Seems to me that this mythical creature could be blamed for all the murders and accidents – “it was’t me, gov, it was the dobhar chu”. Good thought Jessica – and they would have gotten away with it too, if it wasn’t for you meddling kids! Fascinating story. I believe all legends come from a true fact. Was it a monster? Taht I can’t say, but I think some kind of wild animal must have lived here for a long time and give life to the legend. Thank you for the comment jazzfeathers. I’d love to think there was something to it – who knows? Cool post! Came here via Ed’s blog. Love Winderjssc’comment and your reply. Hope your Samhain was a good one. Kate. Thanks Kate, appreciate the comment. I’ll keep an eye on your blog too. Thanks Cybele. Grateful for the encouraging comment.